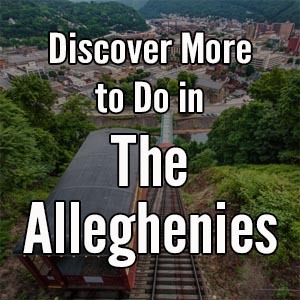 There are many great show caves in Pennsylvania, but, with the possible exception of Indian Echo Caverns near Hershey, none of them as easy to reach as Lincoln Caverns. 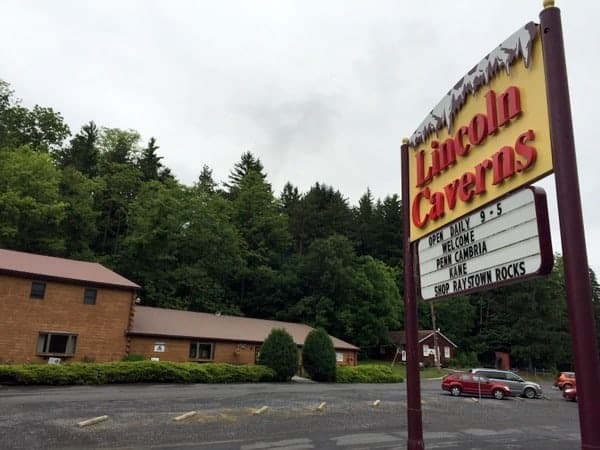 Located along Route 22, just a few miles west of downtown Huntingdon, Lincoln Caverns’ history and success as a show cave are intertwined with the highway. In fact, Lincoln Caverns was discovered by work crews blasting the mountain to build the highway in May 1930. A year later, the cave was opened for business by the Stewart family who owned the property on which the cave sat. Calling it Hi-Way-May Caverns, the family ran it for just one year before putting the property up for sale. Myron Dunlavy, Sr., a businessman from Buffalo, New York, leased the cave and changed the name to William Penn Caverns in 1932. Then, in 1937, after fully buying the caverns, Dunlavy changed its name to Lincoln Caverns to honor his favorite president. Since then, the cave has retained the same name and been owned and managed by the Dunlavy family. Lincoln Caverns as seen from Route 22 west of Huntingdon. Myron Dunlavy, Jr. was just as interested in caves as his father and spent much of his childhood digging out the property’s sinkholes in search of another cave. Finally, in 1941, he literally tumbled into another cavern. 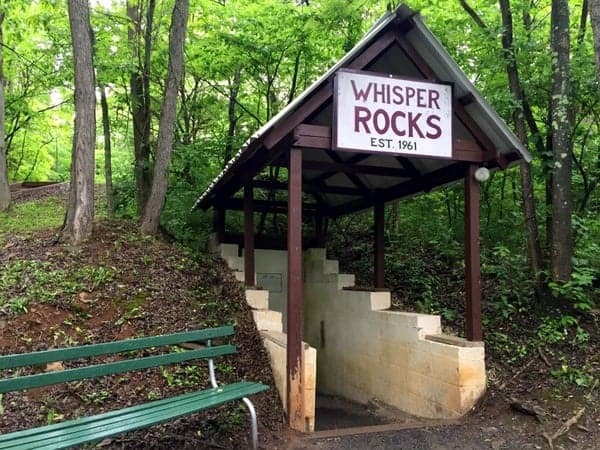 This cave, which became known as Whisper Rocks, is also included on the tour, making Lincoln Caverns the only cave tour in Pennsylvania that allows visitors to explore two separate cave systems. The first stop on the hour-long tour is Lincoln Caverns. While the original entrance of the cave was located along Route 22, a new entrance has been built next to the visitor center and off of the highway. However, this original cave entrance still exists. Uniquely among Pennsylvania caves, this entrance allows handicapped visitors to enter the cave and see a small portion of it without having to navigate stairs (It might be best to call ahead to confirm availability if you want to take advantage of this). 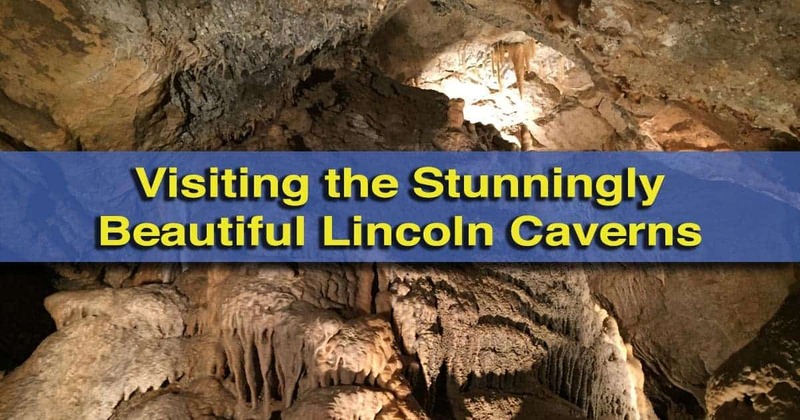 In addition, Lincoln Caverns’ coupons can be found at things to do near Lincoln Caverns such as area hotels and campgrounds. The tour of Lincoln Caverns is pretty typical of cave tours in Pennsylvania. Guides lead you through the different rooms of the cavern, telling about its formation and some of the features that you see. Of course, it’s not all serious lessons, as there is plenty of time to point out a few formations that may or may not look like various animals and shapes. 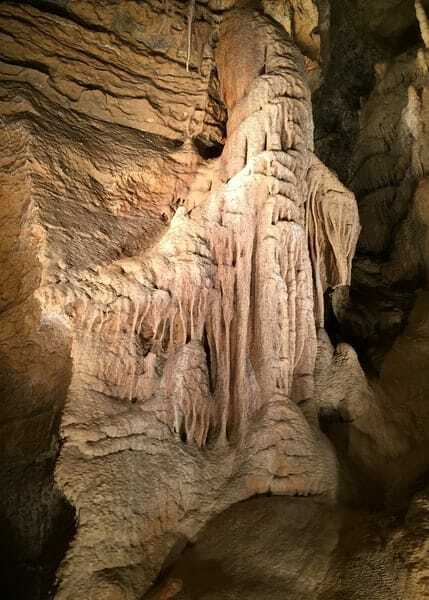 Beautiful formations inside of Lincoln Caverns. One of the most interesting shapes in the “Frozen Niagara.” This is one of the largest examples of flowstone in the northeast and measures 90 feet long and 110 feet high. Flowing down the wall of the cavern, it’s not hard to see why it was named after this famous waterfall. After visiting Lincoln Caverns, visitors return above ground and take the short walk uphill to Whisper Rocks. Despite not being called a cavern, Whisper Rocks is a multi-room cavern that is probably even more beautiful than the site’s namesake cave. Since Whisper Rocks has many smaller passageways, visitors only get to see about half of the cave, however, this is more than enough to get a great feel for the cavern. The entrance to Whisper Rocks on a hillside above Lincoln Caverns. The largest room on the tour of Whisper Rocks is known as the cathedral. This impressive room is quite large, and your guide will likely point out where Dunlavy, Jr came into this room when he discovered the cave. One unique aspect of Lincoln Caverns is the events that they run. Whether you want to visit Santa in the cave, take in a concert, or tour the cave by flashlight, there are many great events happening throughout the year at the caverns. 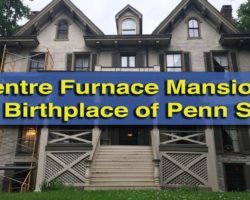 To my knowledge, there are no other caves in Pennsylvania that offer as many events inside the cave. Formations inside of Whisper Rocks. 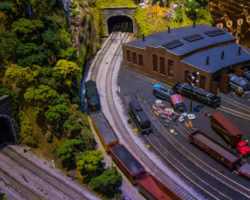 Overall, Lincoln Caverns is a great destination for visitors to Huntingdon County, Raystown Lake, or those just traveling Route 22 through south-central Pennsylvania. 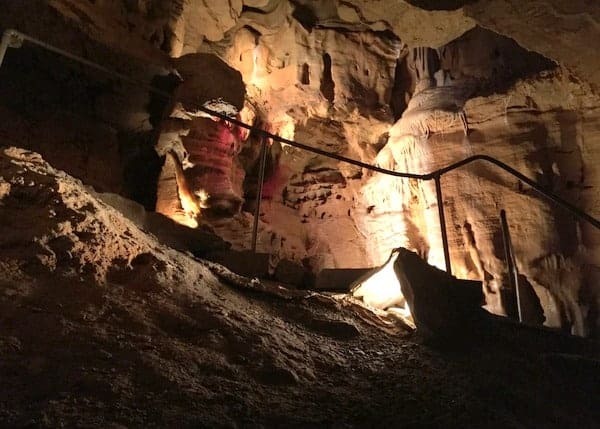 While much of Lincoln Caverns isn’t significantly different from other caves in the state, the beauty of the caves and easy-to-reach location make this a great choice for those looking to explore the underground world of Pennsylvania. Note: My visit to Lincoln Caverns was hosted by the site. However, the opinions expressed are my own. 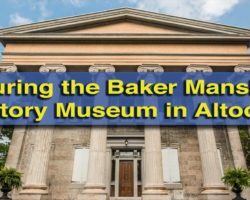 Looking for other caves to visit in PA? 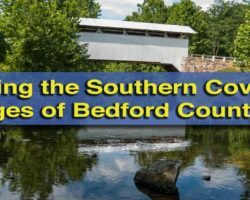 Check out Penn’s Cave, Indian Echo Caverns, and Crystal Cave.